Starting today, you can now customize the Sprout Queue for each of your connected profiles individually! 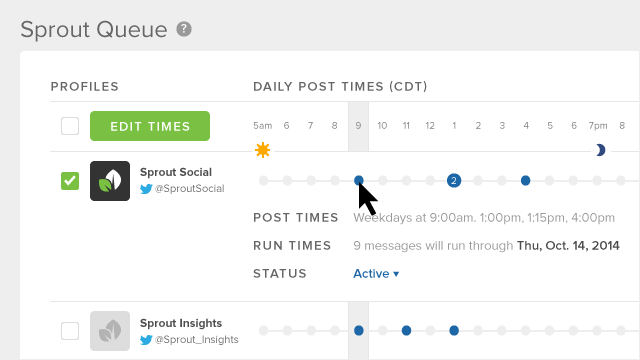 The Sprout Queue makes it easy for you to maintain a consistent presence on social without having to spend time scheduling every message. Your team can add content to the queue, and Sprout will automatically publish your messages at preset times or when your audience is most engaged. 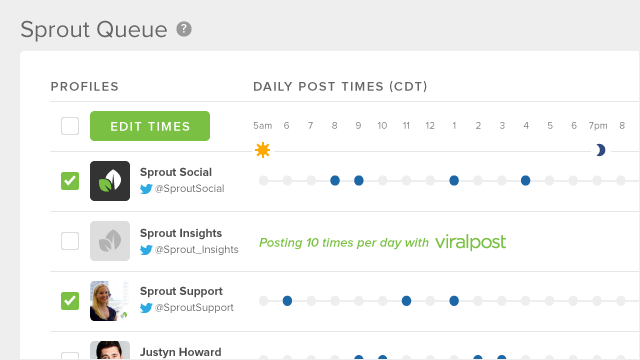 In the improved Sprout Queue, you can configure up to ten custom post times for each of your profiles—allowing you to set times that make sense for each of them individually. This new functionality will be extremely helpful if you maintain a different profile for each of your brands or key markets, if you manage a portfolio of clients, or if you just want to queue messages at different times for Facebook and Twitter. In addition, now you can also choose to use ViralPost for each profile, too! ViralPost analyzes your audience to determine the optimal times for you to deliver content based on usage and engagement patterns, content velocity, and other factors. It then automatically delivers content at the moment it will have the greatest impact. Of course, you still have the option to apply just one set of post times to all of your profiles and the ability to turn ViralPost on for all of your profiles at once. When you set up post times for your profiles, you’ll also notice a brand new timeline view. From here you can identify gaps in your publishing times, and see how long your currently queued content is set to run. As always, you can add content to the queue from Sprout’s web or mobile apps, as well as from the Sprout browser extension or bookmarklet while you’re browsing the web. A couple friendly reminders about Queue: Only your account owner can set up the Sprout Queue. ViralPost is available on all Sprout plans.